Ferratas Xorret del Catí & Norte del Cid, plus Despenyador (I) A one day route around Sierra del Maigmo, Alicante. 2 The downloadable gps/google Earth map. 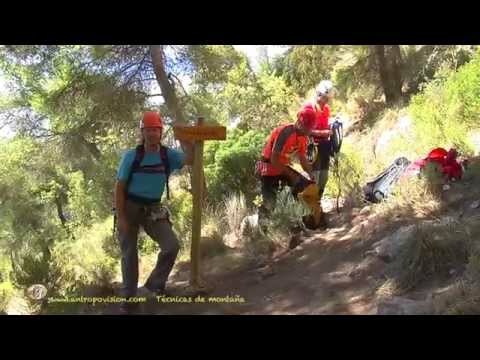 Here’s a route that combines in one single day 2 ferratas in Alicante, Ferrata Xorret del Catí (Castalla) and Ferrata Norte del Cid (Petrer) and an easy trek to El Despenyador, a summit that is a 360º balcony where you can easily identify all other Alicante sierras, on a clear day. 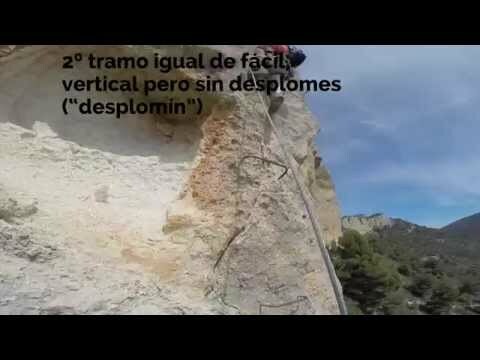 Recommended order: 1) Ferrata Xorret del Catí, 2) Trek to Despenyador, 3) Ferrata Norte del Cid. If you do it the other way round, you’ll find Xorret del Catí too way disappointing. Abseil: There are 2 abseil points, every 25 mts. Good anchor points with eyebolts (don’t pay attention to the abandoned maillons). Descent: Foot path descending a gully. There’s a steel wire for better security when scrambling down. Best time of the day: early morning, late afternoon (during long spring and summer days). Best time of the year: autumn, winter and spring. As described here, we took an optional trekking route to El Despenyador, starting just at the finish point of this via ferrata. We followed the clear track along the ridge, it took us about 40 minutes to reach the summit (1261m. )…and we enjoyed the views…and the unavoidable sad smog, all above us, no matter how high you go, it’s there. The downloadable gps/google Earth map. Short video we recorded with our gopro. Check it out. This ferrata is as easy as pie. 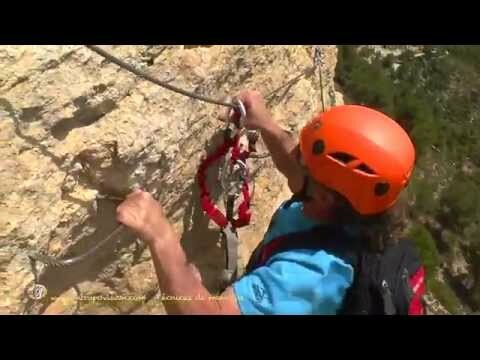 Great tutorials by Fedme, this video was shot at Ferrata Xorret de Catí (Alicante). In Spanish.